Dinosaurs were grouped into three categories; carnivore, herbivore and omnivore. 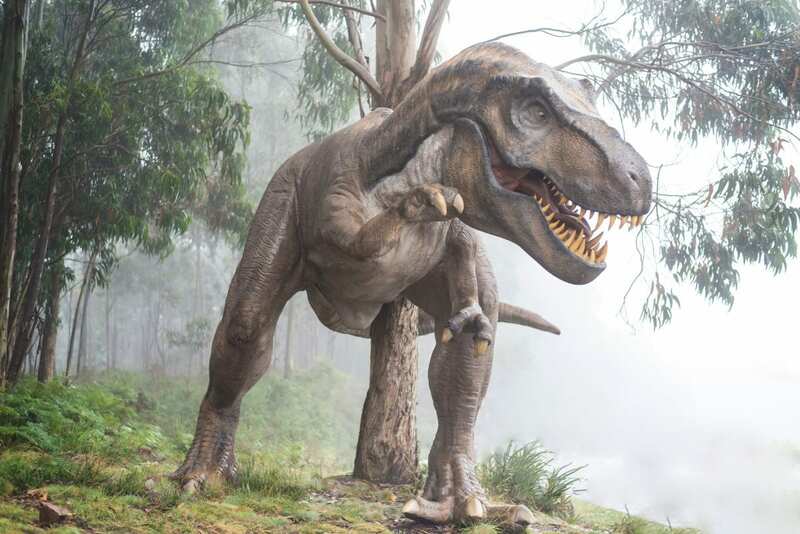 Carnivores were meat eaters which included eating animals and sometimes even other dinosaurs! The tyrannosaurus rex was also a cannibal. It had been discovered that they the T-Rex has also eaten its own kind. (Oh dear) Our herbivore dinosaurs only eat plants, a few types of herbivores include the Apatosaurus and Ankylosaurus (which you can find on our golf course) and some of them had to eat a bus worth of plants to be full each day. (That’s a huge appetite!) An omnivore eats both meat and plants just like us. To help fight off the meat eaters, most herbivores had natural weapons like spikes on their tails or horns on their head. Even though they had ‘natural weapons’ most plant eaters stayed in groups as another form of protection. Most dinosaurs were vegetarians, with a very small amount eating meat and an even smaller group eating both. At this current time over 700 different dinosaurs have been discovered! It is believed that dinosaurs are the ancestors of lizards and birds. The birds we see flying around today are considered the closest living thing we have to dinosaurs (pigeon-osaurus). The largest dinosaur to roam the earth was the Sauropod, they were roughly 25-27 metres long and 15 metres tall. However, the blue whale is a lot bigger than any dinosaur. The smallest dinosaur is not bigger than a chicken. Some walked on two legs, some on four and some could do both. From research it has been found that most dinosaurs who ate meat walked on two legs and those that walked on four generally ate plants. Micropachycephalosaurus (micro-paci-cef-a-low-saurus) is the longest dinosaur name (don’t worry, our staff can’t pronounce it either), but it was a very small dinosaur, only being a metre or so long. It is believed that the reason why dinosaurs became extinct is due to an asteroid hitting the earth which caused environmental changes that they could not adapt to. Because they existed millions of years ago, palaeontologists do not know what colour, how they sounded or if fossils found where male or female. What colour do you think dinosaur were? Print off a blank dinosaur picture, colour it in and give it to our staff at Dinosaur Escape. The staff at Dinosaur Escape think that dinosaurs are shades of green and brown so that they could hide amongst the trees from other dinosaurs. If you have any cool dinosaur facts let us know by sharing them on our facebook page- Dinosaur Escape Adventure Golf.